After dinner at Macau Macao, we felt throughly dissatisfied decided to walk over to Liang Seah Street to see if there’s anything to sooth that sweet tooth of ours. And Ah Chew Desserts seems to just the perfect candidate for the task! It was a hot day and something cooling is much needed. My order of 蛋花马蹄露 water-chestnut and egg, very refreshing indeed! 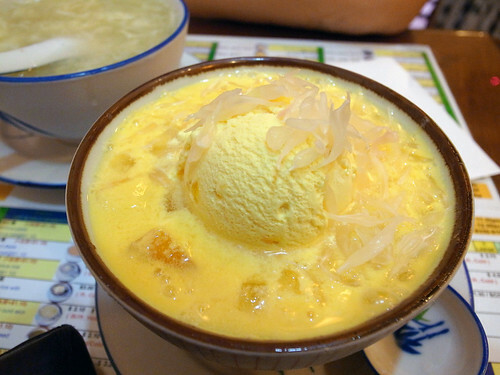 杨枝甘露 Mango Sago and Pomelo with a scoop of mango ice-cream. Simply delicious! Though the bowl seemed small, the amount of mango slices and pomelo pulp was generous! In retrospect, it seemed to be a better idea to omit the mango ice-cream. Though for just a mere 90 cents more, the glob of ice-cream seemed to have taken up quite a substantial bit of the bowl, rendering a smaller serving, techically speaking, of that 甘露 goodness! Revelation! Being very big Tung Shuei 糖水 fans, we are definitely coming back to try more from their menu. This entry was posted on November 20, 2010 by Alan (travellingfoodies). 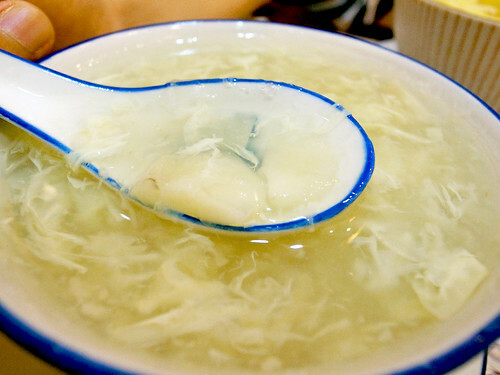 It was filed under Food and was tagged with Liang Seah Street, Singapore.